Here's a stock that keeps showing up on various lists at Alert HQ. It is on the Reversal Alert list based on weekly data, it's on the Total Return Ratio list and on the Value Stocks with Increasing Dividends list. These last two are available during the free preview period at Alert HQ Premium. You can see the stock dropped abruptly earlier in July, established a base and has been rallying furiously the last couple of weeks. On this weekly chart, the gains have been sufficient to trigger buy signals on both Williams %R and Slow Stochastics. In terms of dividends, the company recently announced the initiation of a quarterly dividend. At $0.25 per share per quarter the forward annual rate is $1.00 for a yield of 3.7% which is not too shabby. In terms of its value characteristics, the company has a PE of 14 which is not excessive but is also not particularly low. The other criteria, however, are all very solidly in value territory: PEG is merely 0.39, Price to Sales is barely above 1.0, Enterprise Value/EBITDA is only 2.79. The combination of low PEG and generous dividend was enough to land the company on the Total Return Report. What instigated the plunge in July was the announcement that Comtech had lost a contract to supply the U.S. Army with satellite bandwidth, satellite terminals and other ground gear. Comtech bid $500 million and, given that their market cap is only about $800 million, not winning the contract was expected to have a material negative impact on the company's profitability over the next couple of years. Apparently, investors are rethinking the situation and have decided the sell-off was overdone. One analyst, Chris Quilty of Raymond James, said late in September that shares were "trading at a lowly 2.9 times the expected $116 million in earnings before interest, taxes, depreciation and amortization (EBITDA) for fiscal 2011". 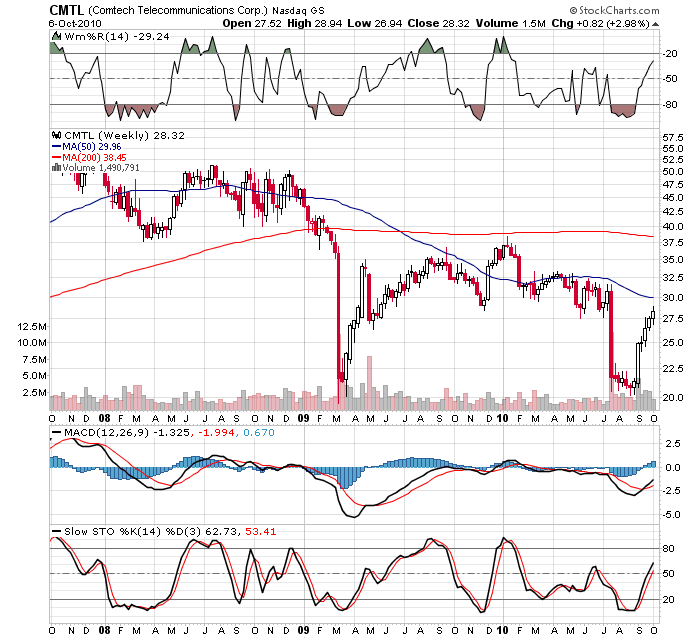 Quilty also said Comtech shares should trade at a multiple that is closer to its peers of six times fiscal 2011 EBITDA, so he raised his target price for the shares to $33 from $30, and maintained a "Strong Buy" rating. In the meantime, the company has not been standing still. Just today the company announced that it had been awarded a $1.2 million contract from the Air Force for plug-and-play microsatellites. So it looks like an interesting turn-around situation might be playing out. And you have to ask, how bad can things be if, despite losing a contract, the company is still able to institute a dividend? This stock could be attractive on a pullback to it's 50-DMA in the neighborhood of $24.